I can’t believe it has been a month since I posted anything! I’ve been working on a couple of projects but I can’t show anything from them yet, so here is a promo sketch that I’ve been working on in my spare time. There are a few things to fix and hopefully I’ll get it painted in the next couple of weeks. love the name of the school, i bet grandma does too. That dino is fantastic. Great character. 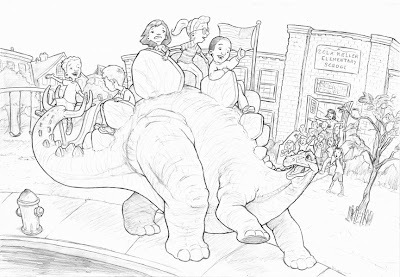 I’d want to be the one riding the dino’s tail… so fun! Previous post: When pigs fly…… or at least try to!